This fruity little pick me up is one to get the tastebuds going! If you don’t have a juicer, peel and core the pears then liquidise with the raspberries, grenadine and lime juice then press through a sieve. It’s a taste sensation! 1. 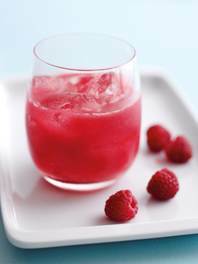 Feed the fruit through an electric juicer and stir the grenadine syrup and lime juice into the raspberry juice mix. 2. Pour into two glasses half filled with ice and top up with chilled sparkling water.